Peaks and Pints Weather Guy has today’s weather for Harry’s Ridge Trail near Mt. St. Helens. Thirty years ago the late Jack Joyce co-founded a small brewery in the Southern Oregon town of Ashland that would gain worldwide notoriety through its ensuing years. Rogue Ales began its journey in 1988. Click here for a two part video series that captures Rogue Ales through its first 30 years. 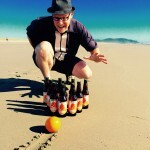 Pelican Brewing Company has received Gold, Silver and Bronze medals at the Brussels Beer Challenge. The international beer competition in Belgium provides a unique opportunity for beer producers to compete with the best international and Belgian brewers. Beer Christmas: A pair of beer and pretzel socks for the person who’s well aware of the best snack-and-beverage combo to ever grace humanity.